The City of Port Phillip (CoPP) is preparing design guidelines and a public realm concept design for the Waterfront Place Precinct. 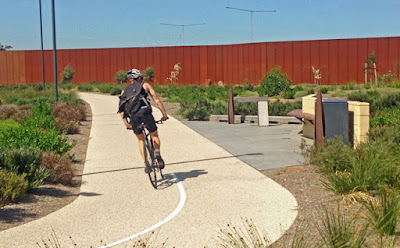 This project is a key action identified by the community as part of the Port Melbourne Waterfront Urban Design Framework. It is timely as the Waterfront Place Precinct and Station Pier are currently undergoing change with a number of development applications and proposed modifications to traffic access in Beach Street, adjoining the precinct. The design guidelines will ultimately form the basis of a future planning scheme amendment. In August and November 2016, key stakeholders representing residents, business and land owners, the Port of Melbourne and TT Lines took part in workshops to explore key challenges, priorities and opportunities in the Waterfront Place Precinct. As a result of the workshops, draft project parameters were formed by these stakeholder participants. You are invited to have your say and complete the survey so we can understand whether the draft project parameters achieve community objectives. The survey will close on Friday 27 January, 2017. A Background Issues Paper has been developed to help inform the community engagement process. You will have an opportunity to provide further feedback through community consultation in 2017. 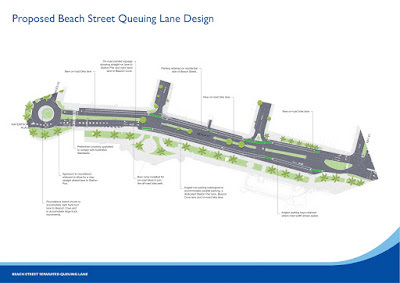 In June 2016, the City of Port Phillip (CoPP) endorsed the refined design of the Beach Street Queuing Lane. A public tender for construction of the Beach Street Queuing Lane was released with a request to deliver works prior to the start of cruise shipping season in October 2016. The tender process revealed it was not feasible to complete the construction within these timeframes. The CoPP has now awarded a tender for the delivery of works. Construction will commence in May 2017 and is scheduled for completion by July 2017. A recent City of Port Phillip (CoPP) Community Forum provided an opportunity for community groups to hear the latest news about the redevelopment. Since the release of the Fishermans Bend Vision last October the Fishermans Bend Taskforce has been working on the Fishermans Bend Framework. The Framework is designed to guide planning and will include the strategies for transport infrastructure (road, rail, trams, and road network), community infrastructure, public space, and density. The Framework will be released as a draft for community comment in the first quarter of 2017. A groundwater study by the Environment Protection Authority found contaminants across the area. More details can be found at: www.epa.vic.gov.au/fishermansbend#Challenges. So far 6,422 residential dwellings have been approved with permit applications for a further 6,032 dwellings. There have been no applications for commercial developments. We have received the following information from CityLink regarding works over the months ahead. You may need to consider this when planning travel over the Bolte Bridge in the next few months. From the night of Monday 5 December, work will start on CityLink in both directions between the West Gate Freeway and Flemington Road to add an extra lane in each direction and install new technology to reduce congestion and improve safety. To minimise disruption to drivers, our crews will work nights only to ensure construction does not impact peak periods on the road. For more information go to http://citylinktullawidening.vic.gov.au. Port People (www.portpeople.org.au) have issued their latest newsletter which has reports on Fishermans Bend and the recent Council elections. It can be downloaded here (warning - it's 12MB in size). 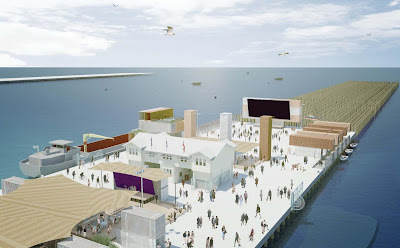 attractions and the installation of replica shipping containers. Alternative access to boardwalks and Webb Trail may be in place from time-to-time to enable works. The Victorian Ports Corporation has been monitoring air quality at Station Pier since January 2016. To help interpret the results, Environment Protection Authority Victoria (EPAV) has suggested a citizen science project. The idea is that the collection of additional information such as smell, wind direction and photos can help in the interpretation of the data collected at the monitoring station. The BCNA has now developed an air quality study with EPAV and, with Port People, are seeking volunteers to record data. We particularly want volunteers from households or businesses who occasionally or regularly experience smells that are likely to come from shipping emissions at Station Pier or Webb Dock. If you are interested in participating, an information sheet explaining the project can be downloaded here. A diary has been prepared in which you can record information for this study. It can be completed either electronically (preferred) using this spreadsheet or completed by hand using this form. Diary entries will need to be emailed or posted back to us each month (details on how to do this are on each form). A report will be prepared at the conclusion of the project and made available to the community. Last week's AGM of the Beacon Cove Neighbourhood Association was well attended and had a number of interesting presentations from VICT (the operator of the new Webb Dock container terminal), our local state MP, Martin Foley, and the new CoPP councillor for Gateway Ward, Marcus Pearl. The report from the President, Eddie Micallef, can be downloaded here. 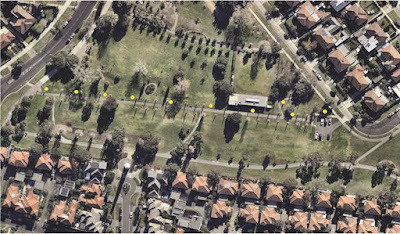 JL Murphy Reserve (the big park over Williamstown Road) - they are seeking your input to inform a concept design for the play space. Help them out by completing a short survey or come down to the Port Melbourne Primary School Fete on Sunday 27 November at 1:00pm to chat with the team. Centenary Reserve has been upgraded with new equipment, facilities, landscaping and even a bright orange Ping Pong table. The latest report from the CEO of the City of Port Phillip (CoPP) can be downloaded here. 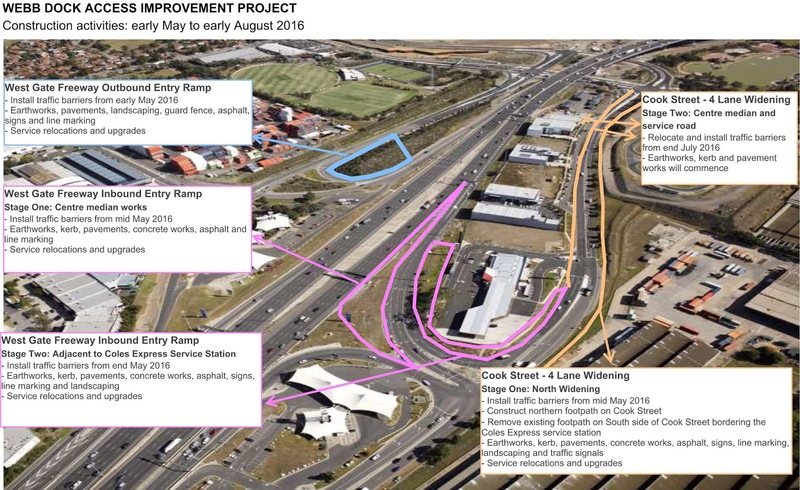 Those of you who enter or exit the Westgate Freeway/Citylink will probably be aware of the works currently being done on both Cook Street (between Todd Road and the eastbound entry/exit from the freeway) and on the westbound entry ramp from Todd Road (the one with the very sharp left hand turn). It seems that the final stages of this work (expected to be finished by the end of December) will require night (7pm-5am) closures of these roads for profiling, asphalt wearing course and linemarking. Prohasky Street does not seem to be affected by the closures. Details of the road closures and associated detours (which are rather complex) can be downloaded here. Allow extra time for the detours or just use Prohasky Street and/or Montague Street rather than Todd Road during this period. If you have any questions or concerns about the works, please contact Mark Davies, Project Manager, BMD Constructions on 0414 613 338 or email webbdockimprovements@bmd.com.au. The State Government has moved to the next phase of the planning of the future of Fishermans Bend with the development of a draft framework for the four neighbourhoods and the employment precinct. Your feedback on liveability, community facilities and services, and public space will help them shape the draft framework, which will be released for further consultation in early 2017. Spaces are limited so please register your attendance at www.fishermansbend.vic.gov.au by 16 November 2016. If you want to stay up to date with Fishermans Bend’s progress email fishermansbend@delwp.vic.gov.au. With local council elections to be held on 22 October, the BCNA and Port People (www.portpeople.org.au) plan to arrange a forum where candidates for the City of Port Phillip Gateway Ward* will speak about their vision and aspirations for the Ward. This is expected to be held in early October at a venue nearby. More details soon. *Gateway Ward is the new three-councillor Ward which encompasses Port Melbourne, South Melbourne, and Queens Road and replaces Sandridge Ward, most of Emerald Hill Ward, and some of Junction Ward. For more details of the changes go to this Victorian Electoral Commission web page. The Victorian Civil and Administrative Tribunal (VCAT) has completed a five day hearing on the owner’s application for the redevelopment of the site. This is for an eight storey building comprising a restaurant on the ground floor and seven levels of residences. The BCNA was an objector to the application as well as the City of Port Phillip (CoPP), a group of residents at “The Anchorage”, and other nearby residents. Objections included overshadowing of nearby residences, privacy of nearby residences, overshadowing of the foreshore in June, a waiver of the requirements for a loading bay which means trucks need to load and unload from the street, and on-site parking for residents and their visitors. VCAT typically provides written decisions within 4-6 weeks. BCNA Committee members have discussed the state of the site with the Mayor on several occasions since our last update in May. The advice we have received is that Local Law is not clear enough to take action to encourage a clean-up. As a result, this situation will be included in a review of Local Law, which is to commence later this year. The review is to include consultation with the community, including BCNA. The latest (July) update from the Fishermans Bend Taskforce (which can be downloaded here) explains proposed work in planning for Fishermans Bend. A final vision statement is to be released in late August. The strategic direction for transport infrastructure, community infrastructure, public space and density will be released in a Fishermans Bend Framework in November. Work is also being undertaken on funding models for the project. Twenty three developments have been approved to date for 7553 dwellings, with twenty four developments under consideration for 7200 dwellings. Three members have joined the committee until the AGM in November. We welcome Geoff Lord, Robyn McKenna and Grant Aldous. These members join the existing committee of Eddie Micallef (President), Roger Joyce (Vice President), Bill Fisher (Secretary & Treasurer), Pam Montgomery, Richard Nowotny and Greg Mate. The City of Port Phillip is sponsoring free music events from 20-27 August 2016 across the city. A feature event is being held at the Globe Warehouse, 1 Fennell Street, Port Melbourne on Saturday 20 August at 6 pm. Further information can be found at www.livenlocal.com.au. A reminder that the City of Port Phillip (CoPP) want to better understand what residents value about the London Hotel on the corner of Beach and Swallow Streets. They are collecting information to prepare a comprehensive heritage assessment which will determine the potential for permanent heritage controls for the site. The survey, accessible here, closes 29 July. In December 2015, four options to reduce traffic congestion were presented to Council. The options were tested throughout December 2015 – February 2016 to determine their effectiveness in reducing congestion. Traffic modelling showed the Queuing Lane option addressed congestion for the majority of peak hour, with the exception of 10 minutes between 7 am - 8 am, where traffic will be delayed by approximately eight minutes. Council Officers have been working with Civil and Traffic Engineer consultants to design a queuing lane in more detail. Subject to a successful tenderer being able to deliver within a six week timeframe, and budget constraints, the redesigned Beach Street Queuing Lane could be completed this calendar year. Alternatively, the construction could commence in May 2017 to accommodate the cruise ship season. The Council Report is available to view on Council's website at www.portphillip.vic.gov.au/june-2016-meetingsagendas.htm. For more information, please go to www.portphillip.vic.gov.au/queuing-lane.htm. The city’s hidden spaces will be open to the public for Open House Melbourne during July and the Port of Melbourne is once again joining the show over the weekend 30-31 July. They are offering free boat tours of major port facilities including Victoria Dock, Appleton Dock and Australia’s busiest container terminal, Swanson Dock. Featuring a guided commentary from friendly port staff, don’t miss this opportunity to see Melbourne’s working port up close. Like most Open House events, port tours will be filled on a first-come, first served basis, with no advance bookings taken. For more details visit the Port of Melbourne open house web page. Victoria International Container Terminals (VICT), the operators of Webb Dock, have a Community Investment Fund grants programme. This year, fourteen organisations working with young people in Port Phillip and in Hobsons Bay will each receive a grant of up to $20,000. A press release with details of the recipients of this year's grants can be downloaded here. Don't forget that Todd Road will be closed this weekend (7pm Friday to 5am Monday) between the Life Saving Club and the freeway. The works will involve cutting out existing pavement and replacement with new asphalt. Full details are in the flyer which can be downloaded here. The latest update on current works at Webb Dock can be downloaded here. Do you have any old photos, news stories, anecdotes, maps, plans, anything that would be useful in assessing the heritage value of The London Hotel on the corner of Beach and Princes Streets in Port Melbourne? The City of Port Phillip Council would welcome all available information relevant to the heritage assessment of the London Hotel. The heritage assessment will be undertaken by an external consultant and all information will be provided to them. Particularly where a site is being considered from a social and historical perspective, consultation during the assessment to obtain such information will be a crucial part of the process. The exact nature of this process will be determined by Council in partnership with the consultant. Please forward any relevant information (and encourage others to as well) to strategicplanning@portphillip.vic.gov.au or contact Katrina Terjung (City of Port Phillip) on 9209 6439. A new plan for Fishermans Bend (Fishermans Bend Recast Vision) has been published and can be downloaded here. It is expected that by 2050 Fishermans Bend will be home to approximately 80,000 residents and provide employment for up to 60,000 people. The urban renewal of this area offers a city shaping opportunity of international significance. For more information on what is proposed or how your views can be heard go to www.fishermansbend.vic.gov.au. As part of the Webb Dock works programme, the final temporary closure of Todd Road between West Gate Freeway west bound freeway entry ramp and north of the Life Saving driveway is scheduled from 7pm Friday 17th June to 5am Monday 20th June, detours will be in place as shown (below). This temporary closure will enable final road resurfacing works. More details of other Webb Dock works can be downloaded here. and perhaps more significant than any of the above, the challenges of adverse weather on the pier might significantly detract from visitor use of the pier. We have requested MAV to examine these concerns carefully and have encouraged them to arrange a community information session once they have developed their ideas sufficiently. BCNA has not developed a position on the current proposal. A position will be established once consultation and feedback from members has occurred. More details are outlined in a letter to members which can be downloaded here. The MAV Proposal / Feasibility Report can be downloaded here (main report) and here (appendices). The derelict state of the site at 1-7 Waterfront Place was highlighted by the Herald-Sun and other media on 6th April 2016. BCNA President Eddie Micallef was interviewed and this enabled him to highlight the fact that the site was an eyesore to the local community and to tourists who were collected by bus from outside the site. Since then BCNA has met the Mayor and has written to Council urging them to examine what further steps might be taken to encourage a clean-up of the site. Further to the recent post about the widening of Cook Street and changes to the entry and exit to the West Gate Bridge we have received some more information from the contractors. The work will take place from now to early August. Details of the works and potential impacts (eg lane closures and speed limits) can be downloaded here. We'll provide futher updates here when we receive them, however if you have any questions, please contact the contractor on webbdockimprovements@bmd.com.au. Some of you may have noticed that the Princes Pier gatehouse has been visited regularly by school students. We're trying to get some more information but an article in the Herald Sun (needs a subscription to read it) suggests that it is being used, in conjunction with other venues, as temporary classrooms for Albert Park College Year 9 students due to delays in construction of their new Year 9 campus. It is great to see the College using the gatehouse. As many of you will have seen, works continue on the traffic signals and landscaping across Williamstown and Todd roads, as well as the over-dimensional gate and commuter bike path north of Williamstown Road. We have been informed that a final closure of Todd Road between the West Gate Freeway southern ramp and north of the Life Saving driveway is scheduled for early June. More details to be provided in the coming weeks. We have also been advised that the Webb Dock Access Improvement Project to duplicate Cook Street and improve the West Gate Freeway entry/exit ramps will start this week. We are seeking more information and will pass this on when we receive it. The latest Webb Dock works advisory notice can be downloaded here. The Fishermans Bend Taskforce has prepared a Question and Answer document from questions raised at the community forum on 29 February. It can be accessed here. Questions asked include planning for schools, the provision of community facilities, funding for infrastructure, and a tram crossing of the Yarra River. Main Stage will feature one of Australia’s finest celtic rock bands Claymore, Italian Greek aficionados Magna Grecia, Orkeztra Glasso Bashalde’s wide spanning repertoire from Romanian gypsy to Klezmer, Arabic, Macedonian and other Balkan melodies, powerful mana from Polynesian dance group Nuholani, Melbourne’s favourite 60s Asian/Western garage pop explosion Empat Lima, sensational high energy collaborators Amaru Tribe & The Lalibelas ft. Oscar Jiminez and Nhatty Man, headlined by Australia’s iconic and profound Indigenous voice and musician Archie Roach. The Piers Festival celebrates and reflects on the collective historical and contemporary migration stories at its site, Princes Pier, the significant entry point where almost half of Australia’s post World War II refugees arrived. The Festival brings to life the pivotal role Princes Pier played from 1915 to 1969 in Victoria’s growth and as a gateway to the diversity of cultures that enrich our community. The City of Port Phillip (CoPP) is surveying residents about local speed limits. In particular it is looking at implementing 40km/hr limits on more local streets. The survey closes on 24 March and can be accessed here. The City of Port Phillip has advertised an application to re-develop the London Hotel site at 92 Beach Street and 2-4 Princes Street. The proposal is for an eight storey mixed use building comprising a restaurant on the ground floor and 32 dwellings above. 4) argues that some parking should be provided for restaurant patrons. The BCNA objection is based on research by BCNA member Jill Maddox. Our Secretary Bill Fisher has provided the following report from the forum meeting held on 29th February. Minister Wynne has accepted 34 of the 40 recommendations from the first report of the Ministerial Advisory Committee for Fishermans Bend. The remaining six recommendations have been adopted in part and may be fully adopted after further work. Minister Wynne made the announcement at a well-attended meeting in Port Melbourne on Monday 29th February 2016. BCNA considers this is a good response to the first report of the advisory committee. A refreshed Vision Statement for Fishermans Bend is expected to be released in April for community discussion. 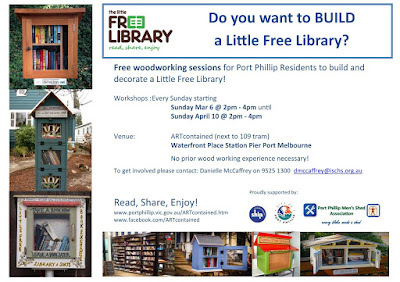 Do you want your very own FREE Little Free Library? Join a growing movement and put a little free library in your front yard or your local park! 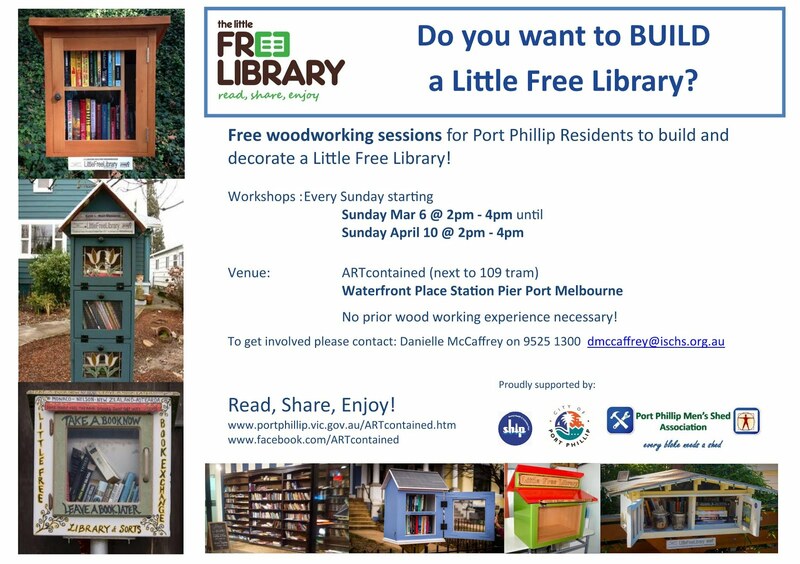 The Port Phillip Men’s Shed Association, Vibrant Villages initiative and SHIP are running some woodworking sessions at Station Pier on every Sunday over March (except Easter Sunday) between 2pm-4pm as part of the ARTcontained project. 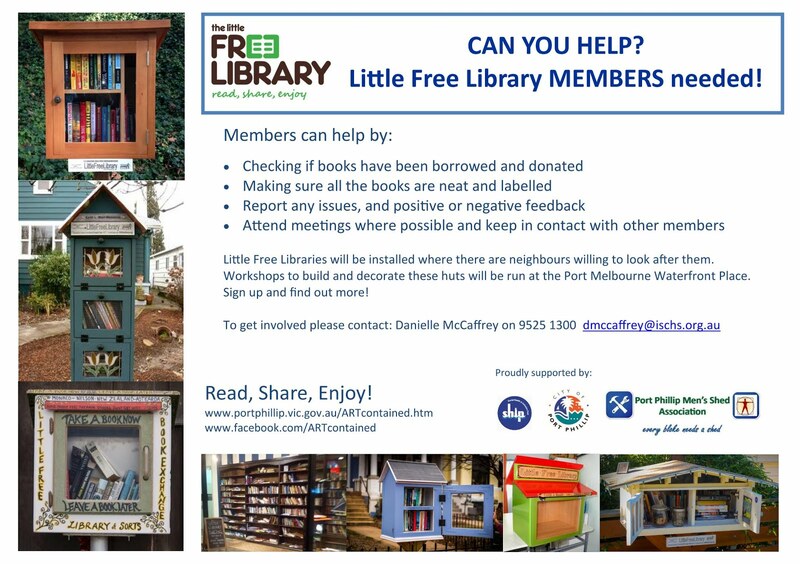 Come along and build your own library for FREE – then share your favourite books with your neighbours! Members of the Beacon Cove Neighbourhood Association have been invited to a public forum to launch the Consultation Program for Fishermans Bend with our local MLA Martin Foley and the Minister for Planning, Richard Wynne. It will be held at Port Melbourne FC Social Club, North Port Oval, 525 Williamstown Road, Port Melbourne (Enter via Ingles Street). ‘Be A Sport’ is an exciting new pilot project coming to Port Melbourne Primary School. We are looking for volunteers who will act as ‘sports mentors’, interacting with students during their lunchtime sporting activities, by umpiring and encouraging fair sportsmanship. Sports Mentors will be assisted by school yard teachers and the PE teachers. If you, or someone you know, can give an hour or two each week, than this could be an exciting opportunity for you! School lunchtimes run from 1:40-2:30pm. A short training session will be provided for interested participants. All participations will need a Working with Children Check and Police Check (we can help you out with these). We are really keen to get a group of volunteers together, so please get in touch if you are interested! Multicultural Arts Victoria (MAV) has released a report on the feasibility of a House of World Cultures for Princes Pier. MAV is seeking feedback on the proposal. 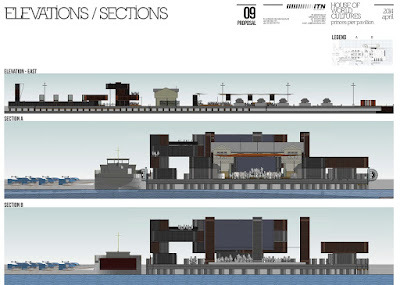 The idea is that a ‘dynamic, active cultural space encompassing the themes of migration, heritage, and contemporary culture - a House of World Cultures’ would be established on Princes Pier. BCNA committee has previously shown support for the activation of Princes Pier and supported the MAV concept being examined for Princes Pier. The feasibility report is available here and appendices are available here. BCNA will be organising a meeting where staff from Multicultural Arts Victoria will explain the proposal and members can ask questions. Feedback will then be assembled and forwarded to MAV. More details will be provided in coming weeks. The Port of Melbourne Corporation (PoMC) have advised that as part of the Webb Dock upgrade project, works to reconﬁgure and close Williamstown Road west of Todd Road are scheduled for 2-7 March. This will involve evening works and a full closure of Todd Road between the West Gate Freeway southern ramp to south of Williamstown Road from 7pm Friday 4th March to 5am Monday 7th March. From 7pm Friday 4th March, Williamstown Road will be closed west of Todd Road and port traffic will access the port via the new internal port road, Webb Dock Drive. Noise mitigation measures are in place to minimise construction impacts. More details to follow in the coming weeks. This week's Webb Dock works notice notice can be downloaded here. We've received the following information about the Port Melbourne Icebergs and thought some residents may be interested. Join us on Saturday mornings at 8am beach side of Port Melbourne LifeSaving Club for a plunge into the waters of Port Phillip Bay. Coffee and conversation to follow. No cost, no join up fee. Just pay for your own coffee. Plunge at your own risk. Contrary to some earlier reports we had received that there were to be no more Piers Festivals, Multicultural Arts Victoria have announced they will present the 5th Piers Festival on Sunday 3rd April 2016. The festival celebrates our Indigenous and shared migration stories at the historical Port Melbourne piers precinct with a range of diverse music, dance, food, forums and exhibitions. Volunteers positions are now open, interested applicants should email Freyja Macfarlane with your CV and this Piers Festival 2016 – Volunteer Form completed. Applications close Friday 4 March. The City of Port Phillip (CoPP) is planning to install a public toilet at the Sandridge Community Centre and Trugo Club building, for use for visitors to Garden City Reserve. They will be holding a community consultation session between 10am and 1pm on Saturday 20th February at the Sandridge Community Centre and Trugo Club. A letter that has been sent to residents can be downloaded here and a poster downloaded here. A striking bronze sculpture of a young World War II sailor gazing towards Port Phillip Bay was unveiled recently on the Port Melbourne foreshore. The sculpture, Answering the Call, is located opposite the intersection of Beach Street and Dow Street, Port Melbourne. It is near the site of HMAS Lonsdale, the Naval Reserve Base which was commissioned on 1 August 1940 and decommissioned in 1992. The memorial sculpture was the vision of Lieutenant Commander Mackenzie Gregory, whose energy and enthusiasm was the driving force behind the project. Port of Melbourne Corporation's (PoMC) CEO Nick Easy joined Commander Gregory’s daughter, Jane Gregory, and representatives from the Royal Australian Navy, City of Port Phillip and the Anzac Centenary Committee at the opening event. The program of free Port Open Day boat tours continues in February, so don’t miss out on your chance to take a behind-the-scenes look at the Port of Melbourne. More information is available here. The Department for the Environment, Land, Water, and Planning will be developing an Environmental Management Plan for the Bay in the coming months. They are currently asking for public opinion on how the community values the bay. This can be found at http://portphillip.delwp.vic.gov.au/healthofthebay?tool=survey_tool&tool_id=what-does-a-healthy-port-phillip-bay-mean-to-you&ts=1453959000#tool_tab. It seems work on the new super tram stop at the corner of Whiteman Street and Clarendon Street has taken longer than expected. Yarra Trams are now saying that 109 trams will not recommence until Tuesday morning. So, as the replacement bus takes a lot longer than the tram, allow extra time on Monday (and perhaps Tuesday since they've delayed estimated completion twice already) if you're going into the city. Yarra Trams have just advised that tram service changes on routes 12, 96 & 109 will continue until approximately 7:30am Sunday 17 January. It was previously expected to be finished today. Sorry for the late notice of this - it's not usually well publicised and I only realised it was on this weekend when I saw some preparations this morning. The Blessing of the Waters, Greek Orthodox ceremonies takes place at Port Melbourne each year in January. This is a combined celebration for all Parishes in Melbourne celebrated by Their Graces Bishop Ezekiel of Dervis and Bishop Iakovos of Miletoupolis together with all the Clergy of Melbourne. The promise of a year's good fortune enticed scores of young Greek Orthodox men to try their luck in the annual Blessing of the Waters Ceremony. The ritual commemorates Christ's baptism in the River Jordan, termed the Epiphany by St. John Chryssostom (from the Greek word for 'manifestation', 'epifaniea'). The ceremony will be at 1pm on Sunday 10 January and will be followed by music, dancing and activities for children until late afternoon. Also, food and drink will be available at the Pier together with a variety of other stalls.